Where Roots And Wings Entwine: Flooring that can handle the childhood years. Flooring that can handle the childhood years. Whilst most of us would love to live in a world where mess is miraculously tided up for us or not seen ever at all and where spills, sticky stains, food fun, dirt and paint explosions are unheard of unfortunately for the majority of parents our little ones usually come hand in hand with mess of some sort. When decorating and furnishing the home as parents to children who create mess and mayhem on a daily basis it can be a wise move to think hard about what furniture, paint and flooring you have so that they can withstand everything your little bundles of joy and mess can throw at them. With flooring taking a particularly hard beating, being used again and again as we all stomp our feet back and forth on it along with children playing on it, picking the right flooring is vital. Whilst soft, warm and cosy on the toes carpet does have its downsides. If you have a muddy footprint, accident prone, knocking over drinks, paint splashing creative and stain-creating kind of child like I do carpets simply cannot withstand the abuse which takes its toll leaving the carpet looking stained and old fast! Laminate flooring can be great for cleaning up stains and dirt however it can look very artificial and I have found that the busyness and boisterousness of a child can leave tell-tale signs of mistreatment and hard use with laminate flooring wearing very quickly and warping where it has had the odd wet spill. A great and very hard-wearing flooring variety is engineered wood flooring. Designed to be tough and durable this flooring is ideal for withstanding the use and abuse that children can create. The flooring looks very natural and is a great cost-effective alternative to real wood. Unlike laminate flooring is does not wear easily and can withstand many years of use without warping or shrinking. It is also very easy to keep clean and unlike carpets you won’t have to worry about flooring that is looking tatty thanks to stubborn stains that won’t shift, and if you want a touch of comforting plush underneath your feet you can simply add a rug or two to your flooring. 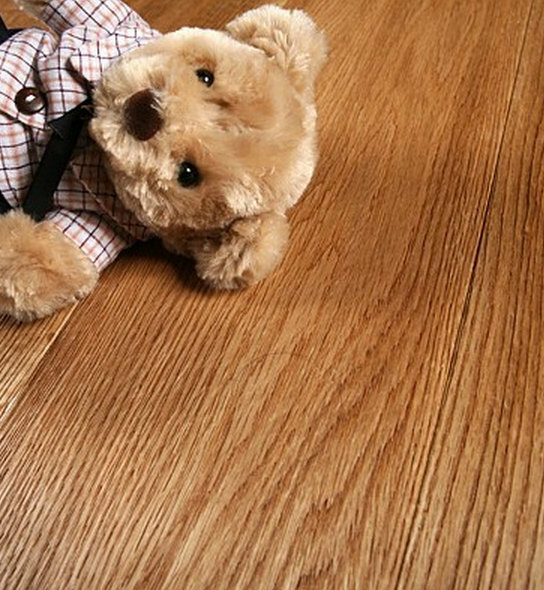 What flooring have you found to be great at withstanding the use and abuse of children and a busy family home?